What is a deposited plan? A plan is an image that defines the legal boundaries of the land. They record subdivisions, easements, resumption or restrictions on the land. Deposited Plans (DP) define legal boundaries of land and often record subdivisions, easements, resumptions or are prepared to support Primary Applications. Deposited plans are identified by a 'DP' number, e.g. DP 825310. 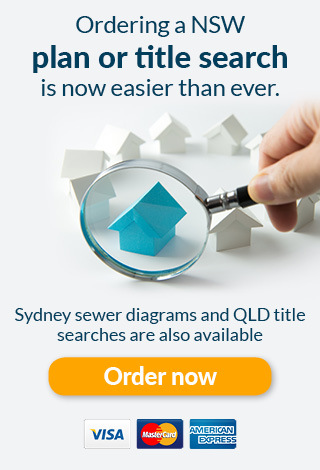 You can order a plan for any property in NSW via credit card here. 88B: An instrument attached to a plan which upon registration creates easements, restrictions on the use of land and positive covenants. Crown plans: Are survey drawings illustrating the land boundaries and physical features of specific parcels of land and may include references to early tenures and ownership of the land. The plans date back to 1792 and earlier. Strata Plan: The strata plan is a subdivision of a parcel of Real Property land into separate lots and common property.